Today we are sharing the last few recipes from our holiday party. I don’t usually make so many sweets, but it is the holiday season, and I am trying to warm my kids up to the idea of living the keto lifestyle. My children are still having a hard time with the idea of breaking away from all things carb loaded, and I can understand why. Leaving the carbs behind was tough for me too, but thankfully they are younger and haven’t spent as many years addicted to sugar as I did. You would think it would be easy to limit what your children eat when they are all 12 and younger, but it’s a battle every day. They go to public school, so they face temptation there, and when we visit family, they are always bombarded by treats that aren’t really treats at all. 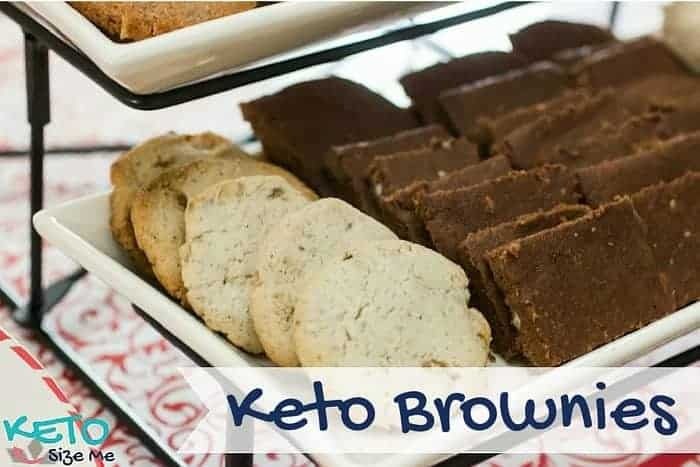 My goal in making so many keto desserts is to show them that you can still have foods that are “fun and tasty” without harming your body. It’s hard for me because I don’t believe we “need” sweets in our diets, but I also have to be realistic about the world my children are living in. The last thing I want to do is get everyone on keto only to have them completely rebel in a few years and overindulge because I controlled their diets while they were children. I want them to understand that there is freedom in healthy eating. Now, in case you are wondering, it is not my goal for the kids to be in ketosis. So for my children I will modify their diets to include more fruits and veggies and a high enough carb count to keep them out of ketosis. I don’t believe they need to be in ketosis to be healthy they just need to monitor their carb intake and eat foods that will benefit their bodies instead of destroying it. Enough about me, let’s get to these brownies shall we? NOTE: Deborah, one of our fabulous readers asked about the coconut milk used in this post and she made a great point. My husband has been doing the shopping for me lately and he picked up some coconut milk for me (and I am thankful because he is just as busy as I am). He grabbed So Delicious not knowing that canned coconut milk usually has a higher fat content. I normally use Goya brand because it is the highest fat coconut milk I have been able to find. When making these recipes be sure to get in as much fat as possible. I also assume that you will be entering your brands into a tracker so you can get your exact numbers for the day. If you already use the fattiest ingredients you will notice that your numbers don’t match mine in this recipe or any other recipe I’ve made using So Delicious and that is fine, actually it’s great. I try not to complain when my husband does anything for me because I need all the help I can get around here, but he is learning and that’s all I can ask for! See all of our Low Carb Cookies here. To clarify, did you use boxed coconut milk (like Silk, etc.) or canned full-fat coconut milk? I used So Delicious, but I usually use Goya because it has a better fat content. That's why you don't let your husband do the grocery shopping ;). I'm going to add a note to the post! Thank you for pointing that out. Could you use heavy cream instead of the coconut milk? It is not something I would have on hand. Kim, you can try it, I don't see why it would be an issue. Let me know how they turn out. Ehehe. I didn't have almond flour, so I substituted it with shredded coconut, not realizing that it's not the same as coconut flour. Also read somewhere that if you substitute almond flour with coconut flour, you have to add extra eggs, so I added 2 more eggs (still thinking it was coconut flour). Also used mascarpone instead of cream cheese... I'm not even going to google the difference, I'm just pretending that I got at least one ingredient somewhat-right. Also, I might have forgotten about butter. Anyways, despite this, they turned out really great and I've been munching on them happily for the last two days! So good. I only started switching to keto four days ago and these kill my sugar cravings very efficiently. Thanks very much for the recipe! Just made these brownies to satisfy a chocolate craving- they are really good! I used HWC instead of coconut milk, and they are really moist, with a texture somewhere between cakey and fudgy.